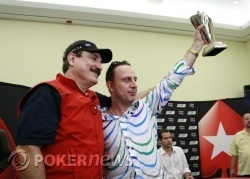 Congratulations to Amer Sulaiman, your 2009 PokerStars.net LAPT Playa Conchal Main Event Champion! What started as a casual holiday in Costa Rica for Iraqi-born Amer Sulaiman turned into the trip of a lifetime. Sulaiman only heard about the tournament after he'd arrived in Costa Rica and decided to play on a whim. The decision proved to be a wise one. After four gruelling days of poker, Amer Sulaiman is your first LAPT Season 3 champion! Sulaimon will take home $172,095 in prize money for his first place finish -- the largest win of his poker-playing career. 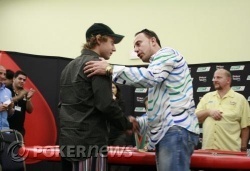 "I got run over once again," he told PokerNews. "I don't feel very good right now... third time in a major spot where I got second place again," said Bergren. While second place is often bittersweet, Bergren will no doubt be able to use the $100,000+ he earned for second place to fund additional world travels. Bergren's finish here today was the second largest score of his young career. That concludes our coverage of the 2009 PokerStars.net APPT Playa Conchal Main Event. Next week, the PokerNews live reporting team will be in two places at once, covering the PokerStars.com EPT Prague Main Event in the Czech Republic and the PokerStars.net APPT Sydney Grand Final in Australia. Until then, from the Paradisus Playa Conchal Resort and Casino in Guanacaste, Costa Rica, good night and good luck! The turn brought the , leaving Bergren with only eight outs to make a straight. The river was the and that was all she wrote. Failing to complete his straight, Sol Bergren was eliminated in second place, earning $100,492 for his runner-up finish. The two players went all the way to the turn with minimal action. The board read and Bergren fired 90,000. Amer Sulaiman called. The river was the and Bergren moved all in. Sulaiman folded and Bergren picked up the pot. In a limped pot, the flop , Amer Sulaiman passed the first option to Sol Bergren who fired a 90,000 bet. Sulaiman called and the turn brought the . Sulaiman then led out with a 220,000 bet -- about 1/3 of Bergren's remaining stack. "Ok, push it one time. Go!" Sulaiman prodded. Despite the invite, Bergren folded leaving himself with approximately 630,000 in chips. 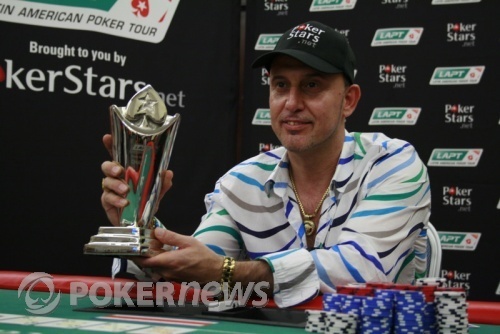 Sulaiman stacked up a tournament-high 4,550,000 in chips after the hand. Sol Bergren was down to single-digit big blinds when he shoved all in preflop for 630,000. Amer Sulaiman folded. Well, we're kidding. There's not much going on as far as action is concerned. The players are limping into every pot and checking down to the river each time. Once in a while, someone will toss a bet in and take down the pot, but other than that, this has been no-action poker. Amer Sulaiman fired a bet of 320,000 on the river of a board reading . Sol Bergren made the call and Sulaiman tabled for the wheel. He then requested to see Bergren's hand and Bergren's was turned over.